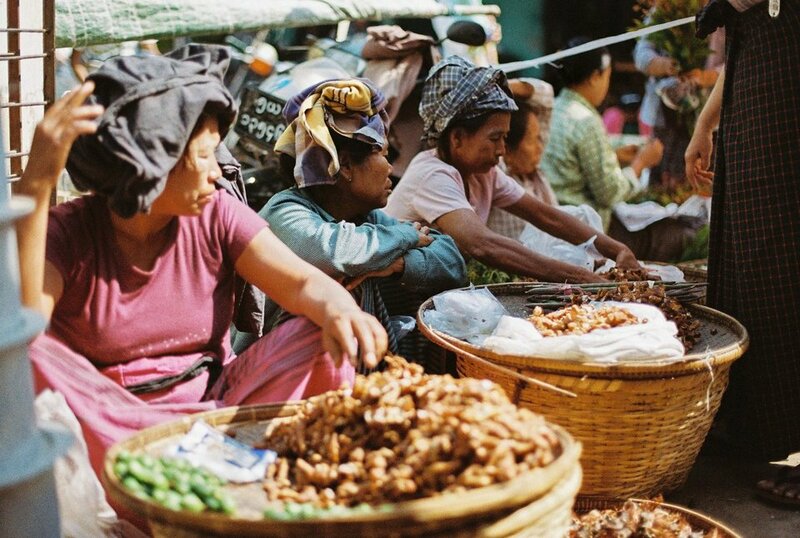 Upon arrival, have a Yangon highlight day tour. Drive to visit Chaukhtatgyi Pagoda with colossal reclining Buddha. Transfer to hotel check in. Have a walk around Sule Pagoda, City Hall and see many colonial architectures. Enjoy sunset at Shwedagon Pagoda, which have been built over 2,600 years ago. Its golden stupa is known as the most famous Landmark of Myanmar. It is always full of local people praying and making offerings and a fascinating place to spend time watching the world go by. Have dinner at Karaweik Barge, where you’ll enjoy the traditional Burmese culture show. Drive back to hotel and stay overnight at Yangon. After having breakfast at early morning, our driver will pick you up at hotel and transfer to the domestic airport for early morning flight to Bagan. On arrival, our guide will meet and greet you, then start a full day Bagan tour by visiting the colourful Nyaung Oo Market, Shwezigon Pagoda, Wetkyi-in Gubyaukkyi (a cave temple with exquisite jatakas mural paintings), the elegant Htilominlo Temple (noted for its plaster carvings) and the Tharaba Gate. Check in the hotel for a rest. Continually explore Bagan in the afternoon including visits to Ananda (an architectural masterpiece of early-style temple), Ananda Okkyaung (one of the few surviving brick monasteries from the early Bagan period), Thatbyinnyu Temple (the highest in Bagan, rising to 61 m) and Dhammayangyi Temple (noted for its remarkable brickwork). Enjoy a fantastic sunset view at one of the famous temples. 3 Day 3 Visit Myinkaba village, Myinkaba Gubyaukkyi Temple,etc. After breakfast at the hotel, be picked up and proceed to Myinkaba village. Observe the process of making traditional lacquer ware, one of the best-known Myanmar handicrafts and a specialty of Bagan. Pay a visit to the Myinkaba Gubyaukkyi Temple (an early Pyu-style temple of Hindu influence). Next, stop at the Manuha and Nanpaya temples. In the afternoon, enjoy an excursion to the countryside village of Minnanthu. Visit some of the interesting temples if time permits, such as Payathonzu, Lemyethnar, Sinbyushin, Nandaminnya and Minnanthu monastery. Enjoy sunset scenes over the Ayeyarwaddy River at Bupaya. Pick up at hotel and cast off from Bagan Jetty at 05:30 am, take a break and have breakfast. After having lunch, crew will demonstrate and introduce the Myanmar culture & Tradition. Finish the cruise tour at around 05:30 pm and check into your hotel in Bagan. 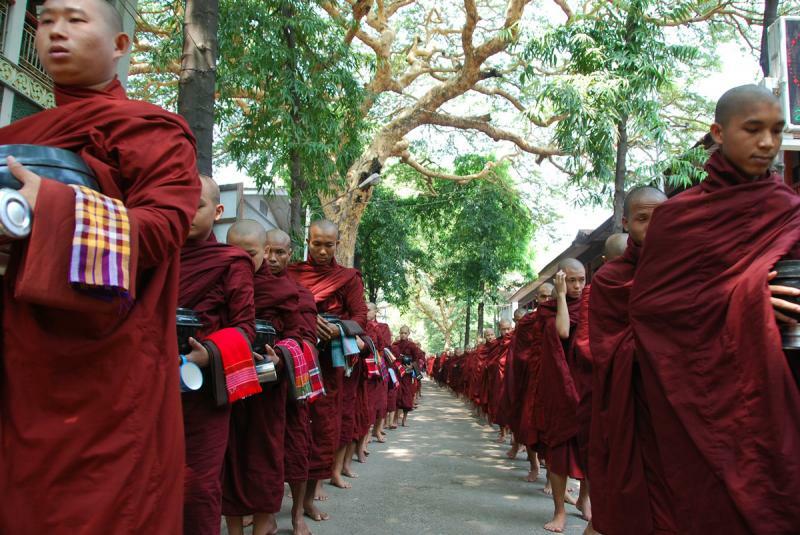 5 Day 5 Visit Maha Gandayone Monastery, Mahamuni Pagoda, Shwenandaw Monastery, etc. In the morning, transfer to visit Maha Gandayone Monastery (home to more than 1000 monks) in Amarapura and U Bein teak bridge. Then proceed to Mahamuni Pagoda (famous for its venerable Buddha statue covered with gold leaves). Afternoon sightseeing includes the Shwenandaw Monastery (noted for its exquisite woodcarving), Atumashi Monastery and the Kuthodaw Pagoda with its 729 marble stone slabs of Buddhist scriptures (known as the world’s biggest book). 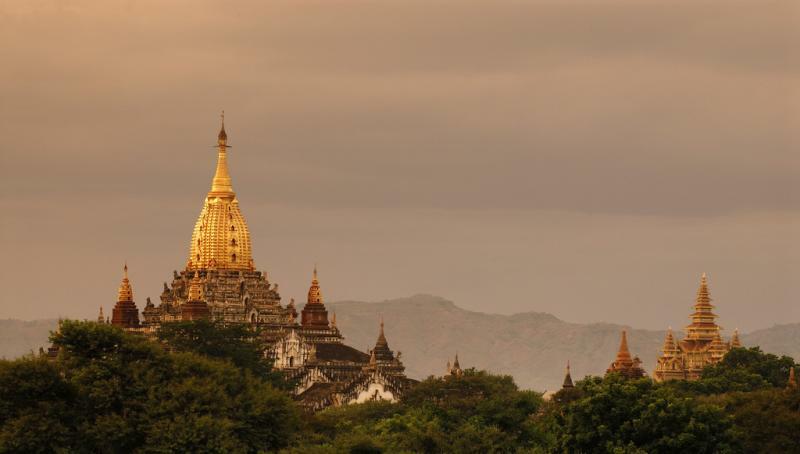 Enjoy a panoramic view of Mandalay City from the Mandalay Hill. After breakfast at hotel, you guide and driver will transfer you to Nyaung Oo Airport for flight to Mandalay. On arrival in Mandalay, drive to Mingun, Shweguni Pagoda. Then proceed to the Unfinished Pagoda, Mingun Pahtodawgyi, which was built during the reign of King Bodaw Paya. Mingun Bell is about 90 tons, and known as the second largest ringing Bell in the world. Then visit the most beautiful Pagoda, Myatheindan, built by Queen Shinphyume. Then head for Sagaing hill across the Ayeyarwaddy River and experience the rural life of Myanmar People. On the top of Sagaing hill, visit a Soon U Pon Nya Shin, U Min Thonesal Pagoda. Continue visit Kaunghmutaw Pagoda with picturesque scenery on the Sagaing hill - a retreat for some monks and nuns. 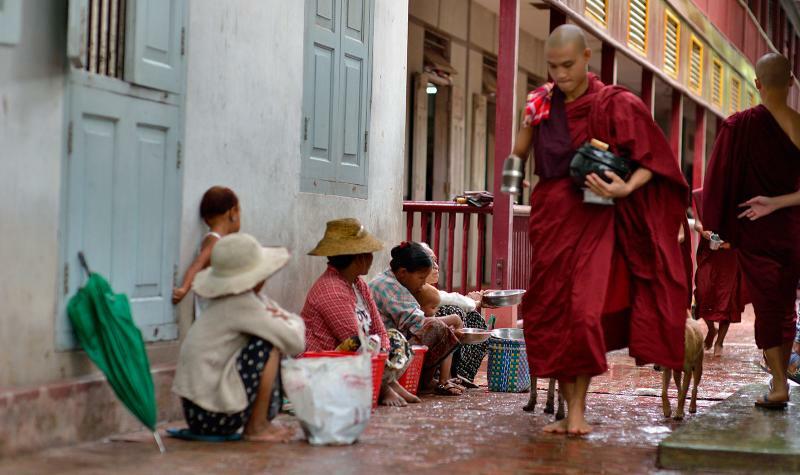 There are over 500 Monasteries on Sagaing hill. Transfer to the airport for morning flight to Heho in Shan State. 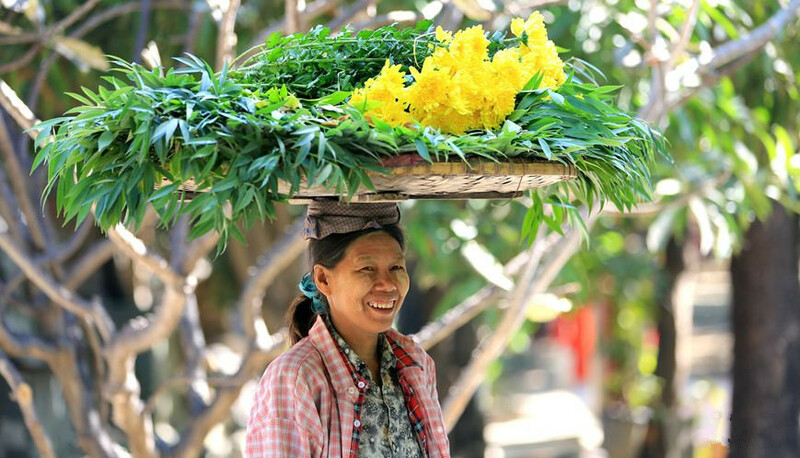 On arrival, be met and greeted by our Inle lake guide. Enjoy a scenic drive to the small quiet town Pindaya, 48 km north of Kalaw. Have a visit of Pindaya Lake and Pindaya Cave, which are well-known for thousands of Buddha images. Enjoy the scenic beauty of the countryside along the road to Pindaya. Visit bamboo umbrella workshop and Red Mountain wine yard for tasting wine. Drive to Nyaung Shwe and transfer to hotel. Take a full day tour of Inle Lake by private boat with chances to see villages, the unique leg-rowers fishermen and the floating gardens, built up from the strips of water hyacinth, mud and anchored with bamboo poles. 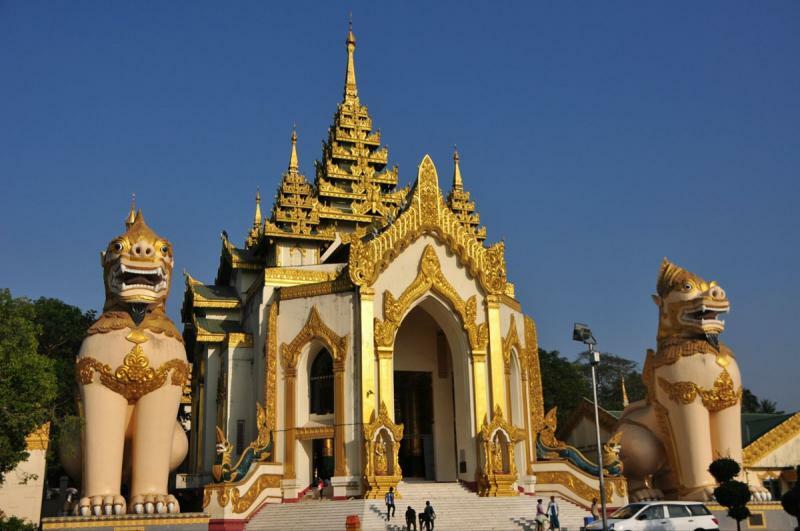 The tour also includes visits to the silver smith factory, the silk weaving village, the Cheroot making factory, the boat making workshop, the jumping cat monastery and the most famous Phaung Daw Oo Pagodas, where the Buddha images have been covered with so much gold that they look like balls of solid gold. At the end of the day, marvel at the Nyaung Oak Pagoda of 14th and 15th century ruins, as well as the Shwe Inn Dein Paya. In the morning transfer to Nyaung Shwe jetty by private boat and enjoy a scenic drive to Heho Airport for flight to Yangon. On arrival, transfer to hotel and free at leisure. Private tours escorted by an English-speaking guide. Meals specified in itinerary as B=breakfast, L=lunch, D=dinner. Domestic flights and trains listed. Visa arrangement. Please consult the local Chinese Embassy or Consulates-General first for the tourist visa. Excess luggage charge(the luggage allowance at economy class is 20kg). Any meals not specified as "B, L or D". Gratuities to guides and drivers.